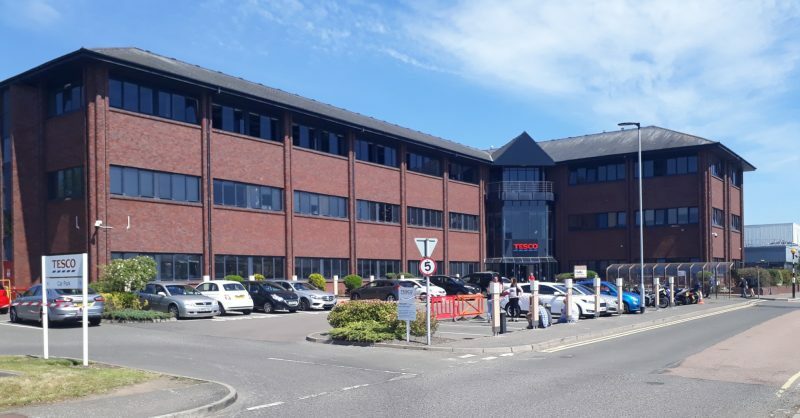 AED are just completing civil & structural engineering on a £7M refurbishment project with Sharkey Group at Tesco’s Call Centre premises in Dundee. The project involves the refurbishment of two substantial steel-framed office buildings, one including the return to use of disused upper floors and the construction of a new external lift shaft to serve it, plus various structural alterations to both buildings. We are also constructing a temporary office building to accommodate staff displaced during the works,. Finally we are also providing foundations, housings and enclosures for M & E plant, requiring the creation of significant retention to a highway embankment. The client’s need to maintain full functionality for the Call Centre was paramount, requiring on-time delivery of the various works packages and prompt responses to problems encountered. Significant problems were faced with respect to the limited availability of record information on the existing buildings’ structures, necessitating frequent site attendance to inspect areas of structure as they became available for inspection, and the incorporation of the findings into the design and drawings as the works developed. All this was achieved while maintaining the tight timescales required for successful delivery of the project on time and on budget.